Author: Wilhelm J.G. Möhlig, Bernd Heine. In collaboration with: Hassan Adam. Series edited by: Wilhelm J.G. Möhlig, Bernd Heine. 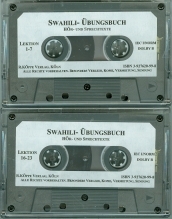 The 2 tape cassettes contain the exercises for listening and speaking that are dealt with in the Swahili-Übungsbuch. The texts are read by three native speakers from East Africa and run approx. for 4 hours, including the necessary breaks for reading the drills aloud by yourself. Please find four sample files of the cassettes below.